In Episode 16, we talked about self-advocacy. One of the items on our list of 10 self-advocacy tips is creating boundaries. Check out the interesting article below (we also refer to it in the podcast). It frames of the important considerations that people with disabilities must face when approaching the topic of boundaries. Listen to Episode 16 of Myelin & Melanin! Self advocacy is an essential life skill to develop and hone when navigating a chronic illness like MS. When dealing with a vicious disease that often strips away our independence and control, it is imperative that we use our voices to advocate for ourselves — by asking questions, asserting our agency, and creating boundaries. Join us as we explore this important topic. What have you done for yourself since the New Year began? Can you believe we are half-way through our year? It is hard to imagine that there are 67 days until fall. Cooler temperatures will soon creep in, and before you know it we’ll be preparing for Thanksgiving. I should probably ask again, have you taken time to replenish, or fill your own tank? Have you carved out enough time to make YOU a priority? Quite often, we become so engrossed in the lives of others which can leave a person feeling depleted. When you do not pause or take a personal inventory, you run the risk of neglecting your needs. In Episode 15, Put Your Mask On First: Self Care And MS, we discuss ways to make sure you’re caring for yourself. When managing a chronic illness like Multiple Sclerosis, it is imperative that you remain a priority. I know the term self care is seen everywhere these days and many go through the day uncertain about where to begin. We are left asking ourselves, how do I start? It is important to know that self care is not a selfish act, it is a necessity. 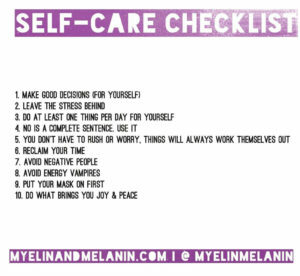 Take a look at this checklist list we feel can help you manage your peace, pause and self care. In addition to the checklist, peruse the article from Well + Good which highlighted Dawn recently. She discusses methods she takes to ensure caring for herself has become priority. Talk to you on Episode 16! Her Instagram feed has been such an inspiration to me, as I am getting adjusted to life in public on my wheels. I have sheltered myself for months, afraid of what others will think of me. I’m slowly getting out of my funk. It’s been hard, but I am thankful to others for sharing their experiences. It’s not easy. I admire their courage. Have you downloaded any MS-related apps that help manage/navigate your disease? Below you’ll find the article we mentioned in Episode 15. I’m still on the fence about them, but that’s another story. Check them out for yourself. Author Daana TownsendPosted on July 8, 2018 July 8, 2018 Categories Multiple SclerosisTags AppsLeave a comment on MS Apps? Listen to Episode 15 of Myelin & Melanin! 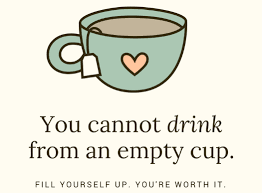 You can’t pour from an empty cup. This is especially true when dealing with a stressful and draining disease like MS. Join us as we share 10 of our most important self-care tips. Self-care is one of the current buzzwords, but have you ever heard of radical self-care? We will talk briefly about this concept in Episode 15. Take a look at the article we reference. It was written a few years ago, but it’s a great read.